Online cab booking service Ola (formerly Olacabs), run by Mumbai-based ANI Technologies Pvt Ltd, seems to have a much more grand plan to leverage its platform for consumer internet services. The firm has floated a job ad in blue-collared job search site Babajob seeking delivery personnel with 'bikes'. Its job ad indicates that those interested would have an option of having two shifts one starting as early as 7 AM and the other ending as late as 11 PM. On the one hand, this means the firm is looking to grab a slice of users who need early morning or late evening deliveries for groceries. The more significant aspect is that it is looking to hire delivery personnel with two-wheelers. This means Ola is not limiting its grocery delivery venture to drivers on its cab network to better use the inventory when the drivers do not have a passenger in the car. Ola had recently rolled out OlaCafe as a food delivery venture through its cab booking app. The service is still available in only certain areas in specific cities. In effect Ola is fully venturing into grocery delivery service and if its move is any indicator it might just start using the delivery boys on bikes to deliver food from restaurants too. The company spokesperson did not immediately offer a comment on the development. 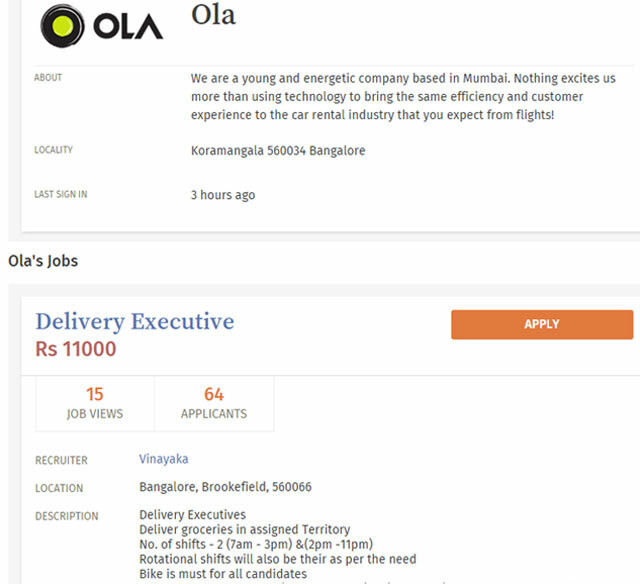 The job ad shows Ola is looking to start the service in a few areas of Bangalore. The food and grocery delivery space has seen a lot of action with a slew of players entering and raising capital while others expanding their presence in the vertical. Amazon launched an express grocery delivery platform in partnership with mom-and-pop stores called 'KiranaNow' in Bangalore on a pilot run before taking it to other cities in the country. The players in this space which are focusing on hyper-local deliveries by partnering with local stores include Local Banya, Grofers and PepperTap. Paytm recently forayed into grocery by launching an app called Paytm Zip to connect users with local online as well as offline grocers. Ola certainly has the means to add a parallel business line to its existing cab booking service. It recently raised $400 million in its fresh round of funding led by Russian investment firm DST Global, which valued it at around $2.4 billion. It also has a set user base for its cab booking app. The question is whether it would add the grocery button in the same app (as it did with OlaCafe) or plans to launch a new app like Paytm. Its competitor Uber launched a similar service in its home market the US last year as UberESSENTIALS. Uber is primarily using its cab network for the service and just like Ola in India competes with delivery focused startups which use two-wheelers as a mode of commute for the hyper-local service. Uber is yet to launch this service in India.